Welcome to the exhilarating world of classic detective, crime, and murder mystery fiction. The Classics That Started it All! The books on this website are the world's best books in the genre. These books set the genre in motion, introduced new ideas that have become standard in the field, and began whole schools of detective fiction -- each with a devoted following of its own. There is a reason for this: Good storytelling, a strong dose of mystery, a detective (often eccentric, always a character!) for one to match wits with, and an often-surprising conclusion all combined to produce an irresistible effect upon readers. And to keep them coming back for more. These books were interactive long before the computer age arrived. In 1941, Howard Haycraft published his landmark book-length history of the detective story -- Murder for Pleasure -- "...in observance of the Centennial Year of the first detective story, Edgar Allan Poe's 'Murders in the Rue Morgue'." But what led up to the first detective story? Was there a day before which there was no literature of this type and after which there was? Were there precursors or prototypes? Howard Haycraft responded to her question. There were no detective stories, he said, because there were no detectives in real life. Haycraft tells us that the earliest appearance of the word "detective" in print was in 1843, according to the Oxford Dictionary, "but it was probably in spoken circulation considerably before that date." But, he tells us, lurid "memoirs" of the Bow Street runners "had begun to appear in England as early as 1827." Before this, crimes had been handled by the military, who often rounded up an innocent simply to appease the public and lay its fears to rest. Then, in 1829, Francois Eugene Vidocq published his Memoirs. Vidocq (July 23, 1775 to May 11, 1857) was a rascal in his youth and had committed a number of crimes. He was imprisoned for his crimes, but escaped -- then tried to arrange an amnesty by offering his services to the Police. He became an informer, first in prison but later at large. Eventually he suggested that a plainclothes division of the police force be created, and this became the Brigade de Surete (or "Brigade of Security"). This later became the Surete Nationale. In 1833, Vidocq founded his own agency, Le bureau de renseignments ("Office of Intelligence"). This is the first known private detective agency. When he published his Memoirs, they became fodder for debate. He had claimed to do so much that many people believe they are largely a work of fiction themselves. Indeed, they influenced many writers who drew their ideas using this book as a source. Haycraft calls Poe "the Father of Detective Story," but Ellery Queen says Vidocq is "the Grandfather of the Detective Story" because of his Memoirs and their influence on the genre. Emile Gaboriau, particularly, was influenced by Vidocq's writings as he created his own fictional detectives, Pere Tabaret and Monsieur Lecoq. Several movies have been made about his life: A Scandal in Paris (1946, with George Sanders, Akim Tamaroff, and Gene Lockhart); Vidocq (2001, with Gerard Depardieu). But there is also a "Great-Grandfather" of the detective story -- the French philosopher Voltaire, who wrote (among his philosophical treatises) a book called Zadig. The protagonist, Zadig, displays the talents of a first-rate detective himself. There is a story in the book about a shepherd tending his flock. The king in the region "lost" his camel -- that is to say, it wandered away from his palace grounds. The king sent his horsemen to find it and bring it back. When his men came upon the shepherd, they asked him if he had seen a camel. To paraphrase the story, the shepherd responded, "Was he blind in his right eye?" "Yes he was," said the horsemen. "Was he lame in his left foreleg?" "Was he missing a tooth in the center of the upper portion of his mouth?" The shepherd says, "No, I haven't seen him." Before he can say any more, the king's horsemen grab him and return to the palace. They bring the shepherd to the king, to whom they say, "Sire, this man claims not to have seen your camel, yet he describes the beast perfectly." The shepherd says to the king, "Well, sire, I knew he was blind in his right eye for an obvious reason. The grass was equally lush and suitable for grazing on both sides of the path. Yet the camel only ate from the left, as I could see from his tracks on the path and from the eaten grass. "He was lame in his left foreleg. I could tell this because the impression in the earth on the path was not as deep as with the other three legs, indicating that he limped. "And as for his missing tooth, each time he bit into the grass, a tuft of grass remained precisely where the tooth in the upper center of his mouth should be. "I was about to direct your men to the direction that the camel followed from the signs he left, but they grabbed me before I had the chance." Well, okay, I'm paraphrasing the story to give you the flavor for how it went. You can read the actual version, as translated from the French, in the Reading Room, where you can sample a number of complete short stories, or selections from longer works of this time period. Just pull up a comfortable, stuffed easy chair, put on your favorite "jammies" and bunny slippers -- or your hideous purple smoking jacket (a la Sherlock Holmes!) -- get a mug of fresh, hot chocolate, or your favorite pipe and tobacco, or a good cigar (yes, atmosphere contributes to a good time, doesn't it? ), and curl up for a good read. All of what was described above was to lead up to the first detective stories, during what Howard Haycraft calls the "Genesis" of the detective story -- the period that began with Edgar Allan Poe in 1841. Edgar Allan Poe wrote his first of three stories about "the Chevalier C. Auguste Dupin" in 1841. These stories launched an entire genre and created templates that are still followed by writers. During the 1860s, after Poe, the detective, crime, and murder mystery story developed into novel form by Wilkie Collins. Charles Dickens and Emile Gaboriau made important contributions to the form. Sherlock Holmes was introduced to the world in 1887. William Gillette, Vincent Starrett, and other early Sherlockians carried forward the influence of the Master Detective. Detective, crime, and murder mystery books continued to develop in America from 1890 to 1914. Not quite as good as their British counterparts yet, America was soon to reinvigorate the form. Detectivve, crime, and murder mystery books received major contributions by writers from the Continent. Detective, crime, and murder mystery fiction entered its "Golden Age" in England from 1918 to 1930. The "Great Detective" was born. From 1918 to 1930 in America, The "Golden Age" of Detective Fiction in America introduced some of the "Great Detectives." In the 1930s, the detective, crime, and murder mystery advanced into the "modern" age. The 1930s brought detective, crime, and murder mystery fiction into the "Modern" Age in America. Sherlock Holmes is the world's first "consulting" detective and remains the world's most beloved detective of fiction. Lord Peter Wimsey. "If the detective story was to live and develop it must get back to where it began in the hands of Collins and Le Fanu..." wrote Wimsey author Dorothy L. Sayers. Agatha Christie's spinster sleuth from St. Mary Meade was considered by high-ranking policemen "in the know" to be the finest detective on God's earth, with the keenest intellect. Hercule Poirot's "little grey cells" make him one of the Master Detectives of all time. "Ellery Queen is the American detective story," said Anthony Boucher. Queen was called "The Logical Successor to Sherlock Holmes." Ellery Queen's solutions are unique in the annals of crime fiction. Dr. John Evelyn Thorndyke was the first "scientific" detective. The "science" was real, resulting in Dr. Thorndyke books becoming required reading in police academies. Nero Wolfe and Archie Goodwin are among the most popular detectives from the "Golden Age" of detective, crime, and murder mystery fiction. The Philo Vance series of murder mystery classics revived the detective story genre and put it back on the literary map. These classics ushered in the Golden Age of crime and detective stories. Charlie Chan was endearing. A large frame, a large family, a gentle manner, and a brilliant detective. Although he only appeared in half a dozen books, he was featured in more than forty-five films. Henri Bencolin -- Mephistophelian, satanic, and cruel -- was John Dickson Carr's first published detective (of more than seventy books). Dr. Fell, one of the greatest and most loved detectives of all time, often solves locked room mysteries and impossible crimes. Sir Henry Merrivale is one of the most beloved detectives in the history of detective, crime, and murder mystery books. The Judge Dee books (starting with a translation of Celebrated Cases of Judge Dee and continuing with pastiches written by the translator Robert Van Gulik) introduced to the Western world authentic 17-Century detective, crime, and murder mystery books. The writings ABOUT the writings! Expert opinions by master critics and devotees. Cornerstones: The Haycraft-Queen "Reader's List"
The definitive cornerstones of detective, crime, and mystery classics that should be represented in every aficionado's library. The Haycraft-Queen Definitive Library of Cornerstone Detective, Crime, and Mystery Books, by Howard Haycraft and Ellery Queen, is a great source from which to build your collection. Recommended links to quality websites that my own visitors will enjoy and benefit from. I'd love to hear from you. Please write, and I will respond as soon as I can. 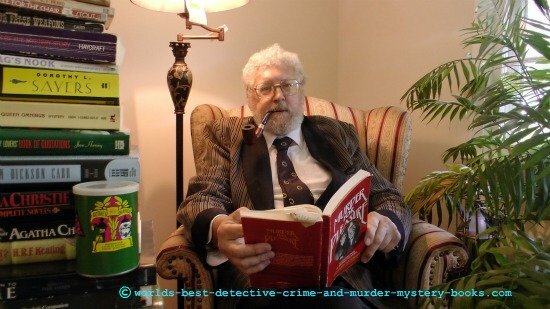 Drew R. Thomas is here to help you build your own library of cornerstone detective, crime, and murder mystery classics from 1841 to 1948.